more than an adventure race. There are enough triathlons and duathlons out there. How about a true test of your season-end conditioning? 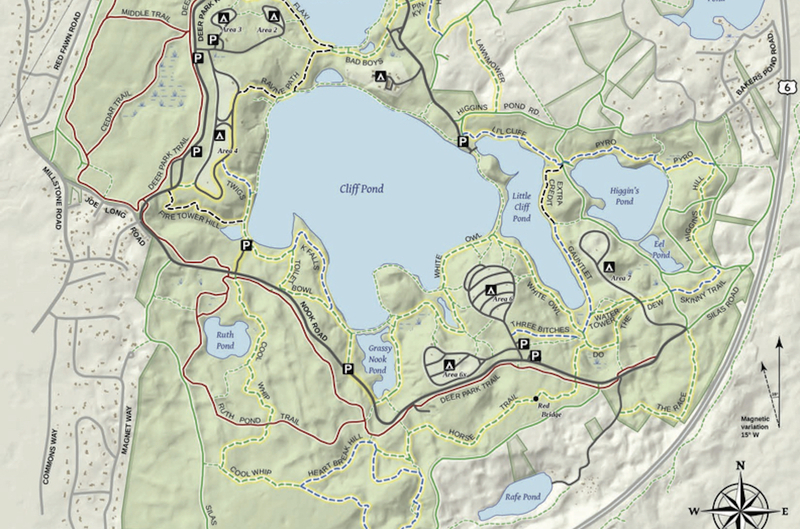 After five successful years as one of the most difficult sprint triathlons in the world, The Gut Check has been reconfigured for 2019 as a point-to-point adventure race within Cape Cod’s 2000-acre DCR Nickerson State Park. Each year, the course will be different — and no one knows exactly what what it will be until shortly before the race. Just know that it will be an endurance workout you won’t soon forget! TO WIN, YOU NEED TO BE MORE THAN JUST FAST. Until shortly before the race, all you’ll know about this year’s Gut Check is that it will combine running, cycling, orienteering and water crossing (surfboard or paddleboard, as this year’s October date is too cold for swimming). You will present yourself at designated checkpoints along the way. Expect a finishing time of from 1 to 2 hours. Whether you compete solo or with a group of your friends (2, 3 or 4 persons), the objective is to use your wits and fitness to scramble your way (and, on the last cliff climb, it will be a scramble!) to the finish. compete with friends...or go solo. Prepare yourself for this event by training to be capable of running and biking for about two hours. While swimming will again be part of future Gut Checks, this year’s late October race day means you will be paddling a board — any kind will do, SUP, kneeling paddleboard, surfboard. Bring your own, or a limited supply will be available to rent. Be prepared for over a mile of paddling. Bring — at the least — a compass and a map! There will be four race categories: solo, two-person, three-person and four-person. All members of a team must remain in close contact and finish at the same time. Race configuration: The 2019 event will involve trail running, road cycling and board paddling (paddleboard, SUP or surfboard — no kayaks or canoes). A limited number of rental boards will be available; registered athletes will be provided a link to reserve. Training: Fast athletes should prepare to be able to run/bike at sub-threshold for 90 minutes. Other athletes should be able to run and bike at aerobic level for two hours. Training similar to that for an Olympic distance triathlon will be more than sufficient. Awards: Categories are male solo and female solo, overall as well as within 4 age groups [Premier (under 35), Masters (35-45), Veterans (45-54) and Senior Veterans (55+). Also: 2-athlete team, 3-athlete team, 4-athlete team. Awards are given three deep in each category. Rain Date: None. Course may be modified due to unusual weather conditions. Questions: All athletes will receive email communications with further details as race date nears. Get on our mailing list to get updates about The Gut Check and learn more about all New England Endurance Events races. DreamDay, located on the outskirts of Nickerson State Park, is a summer camp for seriously ill children and their families. Click the logo to learn more.